Montagu's 23rd annual rose show took place in the NG Church Hall from the 20th-22nd October. Visitors to the show came from far and wide, places such as Port Elizabeth, Durban, Johannesburg, Cape Town, even South Korea and Australia. Credit for this has to go to Toni van Hoey-Smith whose determined efforts with the publicity resulted in Montagu and the Rose Show getting extensive coverage in the national press. The NG Church Hall was a symphony of colour and scent emitted by the abundance of beautiful roses both in the show categories and the displays. None of this would have been possible if it had not been for the unwavering support of the people who entered their roses and their displays. The Rose Show Committee would like to thank all of the participants for making this year's event the huge success that it was. From the overwhelmingly positive feedback received from the visitors, we feel that we can confidently and happily say that we are definitely on our way. Many visitors commented on how wonderful it was that some of the local schools took part and how impressed they were by the standard of the schools' arrangements. Generous amounts of roses were donated to the schools by Rika Joubert, Ronel Steyn, Lillibet Jordaan, Keisie Cottages and Andrea Cook. Without their contribution it would not have been possible for the schools to participate. Also thank you to the principals of Rietvlei 1 and WA Roussouw who were able to bring their children to the show to see their art-work on display. Nelda and I would like to thank all the volunteers for their hard work and help. The ladies from the Garden Club who helped with the ticket sales, the many people who helped us set up the hall on Wednesday and dismantle it again on Saturday, the people who kindly opened their gardens to the public, the judges Rudi Conradie and Pietie Bussell, Eve Wilson for her beautiful design of the program, the superb venue and fantastic co-operation from the management and staff of the NGK. Thank you also to the church ladies for their wonderful cakes and quiches, and lastly a big thank you to all the businesses that also got involved with the rose show, transforming it into a festival. 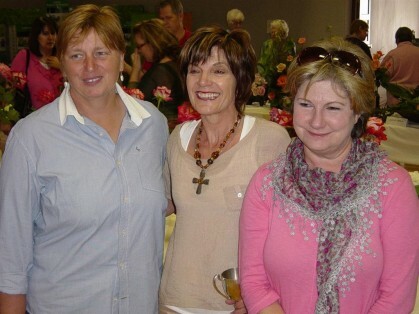 * Rose Queen 2011 is Annelie Kriel from Pietersfontein. * The Five Roses shield went to Willem Claassen, Badensfontein.